By the second half of the 1960s Boris Karloff, considered by many to be the greatest horror movie star of them all, was an elderly man in steadily declining health. He suffered from crippling arthritis, requiring him to wear leg braces. He walked with some difficulty, yet in his ‘60s movies there's invariably a scene where the tottering Englishman with the famous lisp was required to descend a long, uneven flight of steps. He was also suffering from emphysema; in his last films he was usually seen seated, sometimes in a wheelchair. Nevertheless, Karloff loved acting and refused to retire, and partly because of his fine acting he seemed almost robust in his three 1963 movies, made when he was in his mid-seventies: Black Sabbath, The Terror, and The Raven. But within just a few years, Karloff was obviously considerably weaker. His fleshy facial features of 1963 are replaced with a much thinner, almost gaunt face by 1967. In The Raven there's a moment when Karloff actually gallops down a corridor with actress Hazel Court. By 1967 he doesn't look capable of shuffling more than 20 feet without being winded. Yet, Karloff soldiered on. Those three 1963 titles, tailor-made for the actor, were among his last worthy horror films. Except for the underrated Die, Monster, Die! (1965) and parts of The Sorcerers (1967), Karloff made no other significant horror films. A few projects worthy of his talents, such as narrating the perennial holiday special How the Grinch Stole Christmas! (1966), came along, and Karloff frequently guest-starred on various TV shows. Peter Bogdanovich's Targets (1967) was effectively Karloff's swan song, a self-referential drama with Karloff playing an anachronistic horror movie star in an America much more disturbing than his quaint, old-fashioned movies. It was his last American film. After appearing in the forgettable British horror film Curse of the Crimson Altar (1968), all of Karloff's final movies were of Latin origin. Under the direction of Jack Hill, in the spring of 1968 Karloff shot scenes for four extremely bad and cheap Mexican movies, Fear Chamber, The Snake People, The Incredible Invasion, and House of Evil. Karloff's scenes were filmed in Los Angeles while the movies were otherwise entirely Mexican productions shot there. Cauldron of Blood (1970), a Spanish-American coproduction filmed in Madrid, was apparently made prior to those four Mexican films, possibly before Targets and probably even before Curse of the Crimson Altar. However, Cauldron of Blood was one of three movies released long after Karloff's death in early 1969, the others being two of those Mexican productions. 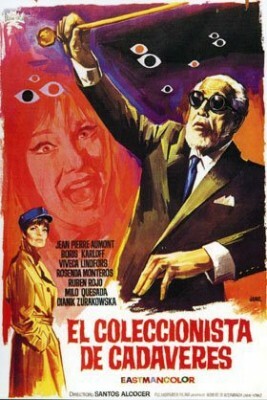 The picture, also known as Blind Man's Bluff and, in Spain, as El coleccionista de cadáveres ("The Collector of Corpses"), has been a difficult movie to see since its original release, rarely turning up on television; I've been curious about it for 40 years. And I'm glad that I finally did see it, especially in high-def. That said, the movie is truly terrible, ineptly made and incoherent at times. At 99 minutes, Olive Films' Blu-ray seems to be the longest version of the film, but that isn't necessarily a good thing. The plot is basically a reworking of countless Poverty Row horrors, and is egregiously padded. The Brute Man (1946), for instance, has similar elements, and so does Roger Corman's A Bucket of Blood, yet one could nearly fit a screening of both of those cheap films into a single screening of Cauldron of Blood. Top-billed Jean-Pierre Aumont plays Claude Marchand, a free-lance photographer assigned to shoot and write a story about reclusive sculptor Franz Badulescu (Karloff), blinded in a car crash that served to enhance his fame. Semi-crippled, he lives on a lavish Moorish castle-like estate in Spain with his manager-wife (not his daughter, as the Blu-ray text claims), Tania (Viveca Lindfors), with whom he has a combative relationship. Marchand and new lover Valerie (Rosenda Monteros, The Magnificent Seven) begin poking and prying around, and after what seems like hours and hours, begin to catch on to what the audience figured out ten minutes in. Unbeknownst to Franz, Tania is secretly having locals murdered, dissolving all but their skeletons in a vat of acid in the dungeon, and providing supposedly innocent castings to her clueless husband. Considering that she keeps a pet vulture around the house, you'd have thought he might have suspected something. Almost everything about the film is astonishingly bad, to say nothing of torturously tedious. Mostly playing a victim to coded lesbian Tania's cruel machinations, Karloff has little to do until the end of the film, where the combination of his limited physicality and terrible direction, including a completely blown opportunity regarding the fate of his character, render the film a depressing, boring mess. Every chance to spice the film up with a little suspense or even a few cheap shocks is squandered. A scene at a gypsy camp designed to generate some tension because the person relating important information is mute becomes a laughable game of charades. Tania's dream sequence, complete with sadistic lashing by her with a whip and a poor wax bust of Karloff's head, is like something out of Glen or Glenda? minus the fun. There are pointless cutaways to nothing in particular, from stock lighting bolts to lifeless crows. Bits here and there weakly imitate Mario Bava and there are gimmicky effects like freeze-frame shots intended for punctuation, but everything has minus-zero impact. The score is equally poor, including a misplaced quoting of "Three Blind Mice," but, peculiarly, some of it later turned up as stock music in several Saturday morning kids shows produced by Filmation, including the animated Star Trek. For such a cheap, obscure film, Cauldron of Blood looks surprising good on Blu-ray. The film is in 1.66:1 widescreen and presented under that title rather than Blind Man's Bluff (for which I could locate no poster art at all). One of the first releases by Cannon Films, the title is now controlled in the U.S. by Paramount, even though MGM holds most of that library. Also curiously, the surprisingly elaborate credits call this "A Film by Edward Mann," but he only co-wrote the script; Santos Alcocer is the director of record. The opening titles are quite scratched up but the rest of the picture actually looks pretty decent, with most of the flaws clearly inherent to the original release. The mono audio is decent; a short scene is in Spanish and includes the original English subtitles. No Extra Features. Unless you're a hard-core Boris Karloff fan willing to sit through anything featuring the beloved actor, you'll not want to touch this with a ten-foot pole, even though the transfer is good. I'm glad to have finally seen it, but I doubt I'll ever want to look at again. Rent It.